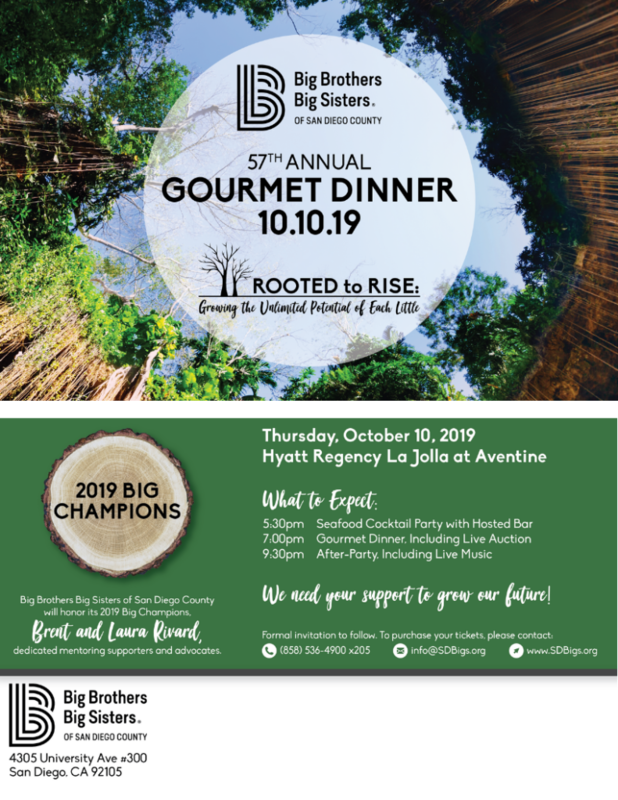 JOIN US FOR OUR 57TH ANNUAL GOURMET DINNER ON OCTOBER 10, 2019! The 2019 Gourmet Dinner, themed “Rooted to Rise”, will host San Diego’s finest, starting with a lavish seafood cocktail party before entering into the ballroom for an unforgettable night and fabulous meal. Following the dinner and program, guests are invited to enjoy an after-party, complete with live music and after-dinner drinks. Honoring 2019 Big Champions: Brent and Laura Rivard, dedicated mentoring supporters and advocates. 9:00PM After Party, featuring live music! FOR A FULL LIST OF SPONSORSHIP DETAILS, CLICK HERE.